Jean-Philippe Courtois, Microsoft's global executive vice president and Microsoft worldwide president, apparently recently visited Suning's new headquarters in Nanjing for the first time, and implemented comprehensive talks with Zhang Jindong, chairman of the Chinese consumer electronic retail chain. According to reports in Chinese local media, the two companies reached an agreement on their comprehensive cooperation over the next few years, and they expressed cooperation intent in various sectors, including e-commerce, product sales, and marketing. Based on the agreement, Microsoft's new smartphone, which will be launched in 2013, will be first sold via the retail channels of Suning. 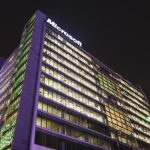 As Microsoft's important channel partner in China, Suning started working with Microsoft to promote the pre-installation of genuine operating systems in 2007. After that, Microsoft launched Windows experience stores in Suning stores and it selected Suning to be the 3C channel for the debut of its Windows 7 operating system in mainland China. During his visit to Suning, Courtois reportedly talked about the launch of Windows 8 and Windows Phone in China. Microsoft said that it will consider Suning as its prior sales channels for these two new products. Meanwhile, it hopes to reach cooperation with the Chinese companies in e-commerce, information technology project construction, cloud service, and sharing platform establishment.